The MF-TC is a homemade tool cart, in my workshop I have my sysport workbench and for small job site work I designed the MFTB tool box. But when I started doing larger job site work helping out other woodworkers I noticed something was not right. Often working on the floor or on shabby work horses at best didn’t feel right. 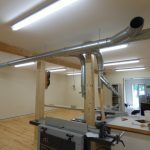 So I started thinking what I could come up with to make working on site as enjoyable and practical as working in my own shop. While thinking about this I tried to find as many problems and issues I found with how most woodworkers work on site, and tried to fix as many of those problems as I could in one solution. That is how after about 10 months of planning, building and testing prototypes I came up with the MFTC! 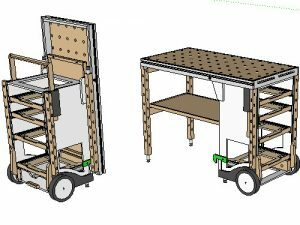 Basically it is a portable workshop, a folding worktable on wheels that contains the basic tools, and can be moved around as a hand truck. 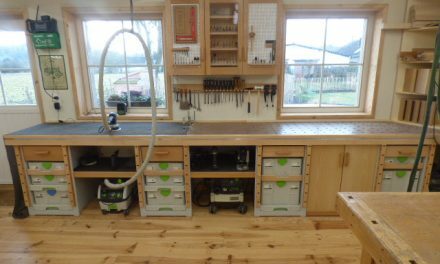 It features a tool shelf with room for a shop vac underneath, which also makes the workbench very stable. Adjustable feet, 4 systainer drawers and a bottom drawer for accessories. The worktop has the same length as a Festool MFT table, only it is 1 row of holes less wide to allow easy passage through doorways and in staircases. The feet of the MFTC have the same holes as my sysport workbench, these allow me to insert clamps and pegs to support work pieces vertically. below you can see the many clamping options and also note the holders on the side for drill bits. Below you can see the size of the workbench when folded and unfolded, it has the same height and length as a Festool MFT, when folded up it takes less than 50cm in depth, this is ideal to store against a wall in the garage or in the trailer/van. Here you can see the bottom drawer which contains all the necessary accessories and more. When designing this I really tried to incorporate as much as possible into the same design, so that you greatly reduce the amount of moves needed to get everything from the van/trailer to the site. The reinforcements at the front allow me to pull the cart up into the trailer or truck bed without damaging it. The homemade accurate hole pattern allows me to use bench dogs to make accurate cuts without any cumbersome or delicate guide system. The longer dogs that support the rail are parf dogs. On the left side of the MFTC I put 2 screws that allow me to hook my battery charger to it. One of my gripes with other portable worktable designs was that the size was fixed, they would often be too large to work in small rooms, or not big enough to work outside. That is why my design had to be made so that it could be adapted to any type of space or work requirement. So I came up with simple folding extension tables, i made two tables that can be attached all around the MFTC by sliding them into the T-track. That way you can adapt the table to your needs, when using a mitre saw on the table you can make it longer on both ends to support long pieces. But by placing both extension table on one end you end up with a table large enough to easily support full sheets. These extension tables have sacrificial strips of wood on top of them so you can saw into it, and replace them when worn too much. Here you can see a full sheet of MDF being supported by the table, while working with this on site I also discovered that placing my systainers underneath this table was very practical. I paid great attention to reducing weight as much as possible, below you can see how these weight reducing openings also serve to store rails while working. there never seemed to be a good safe place to put them while on site before! access all the drawers from the front. Push locks prevent the drawers from opening while driving or when moving the MFTC around! 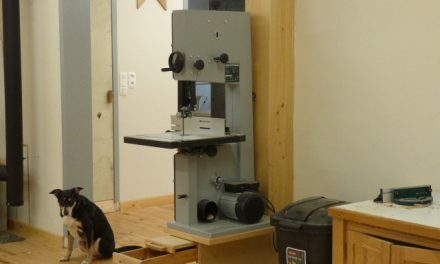 With the extension tables many options are still possible, you could build in a router table, saw table or cover them with a MDF sheet with holes. Anything is possible and they are quite easy to build! Below you can see the rear of the MFTC and on the front you can see the transport handle extended. Below you can see a picture i took while building a built in library and testing the unfinished MFTC, clients were really impressed! The right extension table allowed me to cut parts without cutting into the mdf worktop. It also supported the Kapex at times. You can use these images to try and build you own MFTC, or simply buy the plans. Remeber it took me 10 months of work and building 2 prototypes to get to this result. It is only by selling the plans for a reasonable price that I can make this work worth my time as an independent furniture maker! Those who wish an invoice with separate VAT can contact me with their details and European VAT number. If you built an MFTC I would be delighted to post pictures of it here on my site, so don’t hesitate to send me some. 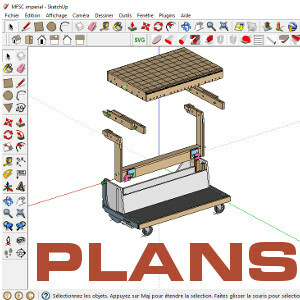 The plans contains a 50 page pdf instruction manual with pictures and explanations of the build process, but also simple layout sheets for each part with quotations and obviously the sketchup model. On this forum thread you can read tips and comments from MFTC builders over the world! Below are no less than 3 MFTC workbenches made in Pittsburgh USA! “I also would like to add that Tim’s plans were excellent and the design/engineering is great! This one was was made by Alan in the US, also check out his cool MFTB living room table! This one was made by Zoltan in Slovakia, used in his living room with different tops for the extension table, here seen with a scroll saw mounted. Below is Freddy’s MFTC of frswoodworks.com in the old LA Lakers stadium! He used baltic birch ply to build his, and for the legs he used a foot meant for a pre threaded metal table leg, with a 2″ all-thread coupler embedded in the wood. He recommends waiting till the end of the contruction to build the legs and side supports so you can adjust them to the actual size of the body or table, in order to make up for slight deflections. He also used a different method for securing the drawers in place, by running a pole through a hole at the back of the drawers. A sturdy option i had considered as well, but was afraid it would not look practical in the video. How do I get the plans for the work bench (MF-TC)? I dont have Pay Pal. Hello Tee, take a look here. You can also buy them by bank transfer, just send me an email. Hi Tim great designs other than wood and my tools to do the job what sort of things would I need to source to make this? How much do you think these items would cost? You basically need wheels, an axle, drawer glides and T-tracks, nothing very special or hard to find. Builders reported costs between $200 and $300. Hi Tim. 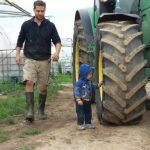 What T-Tracs you used? I used tracks that I found in a DIY store where they sell them as curtain rails, a bit flimsy but they do the work. 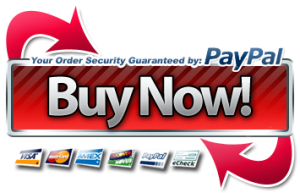 I can also give you some online stores that sell “real ones”, just send me an email. Hello, I purchased all of the plans through Paypal. How long before I should get the plans? Hello, it looks like your mail provider blocked my emails, I have just sent them with another account. Is domino Jointer mandatory? I have all the required tools plus a bisquit jointer. You don’t need the domino, for assembly work you can use your biscuit jointer instead or just screws. And to make the peg holes in the legs you can use a round drill bit. The holes will be round instead of oblong, but it works just as well. 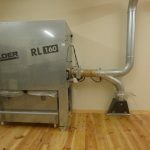 Have you thought about installing lockable wheels to prevent any “rolling” or movement when working, especially with larger sheets of wood? It turns out that the feet are enough to keep it from rolling. In my case at least, it has never really been a problem. I bought your plans over an year ago and now im planning on building it. Do you know a way how to lock all the drawers with just one lock and no lose components? I know that some have blocked theirs by inserting a vertical rod through the cabinet, it goes through a hole in each drawer bottom and locks them that way. It’s simple and effective. I feel this is one of the best portable tables and tool carrier I have seen. Your demo of how it all works is also quite well done. Hello Tim, what kind of Festool systainers do you insert in the drawers ? I only have regular T-locs but the original systainers work just as well. The combination of sizes are vast but mine is always set up for 2x sys1, 1x sys 2 and 1x sys3. Tim- deep in the process of building the MFTC. The Tee-track I have for the edging for the top is the exact same depth as the 12mm outer face of the sides. That would mean no space to route a dado for the track unless I use the 18mm ply for the both layers of the edging or, alternately, just use two strips of the 12mm for the edging and attach the Tee-track directly to the inner layer of the 18mm edging. The last alternative seems to create a less strong top piece. Do you have any suggestions? Jim, If you increase the outer face to 18mm, You will want to increase the width of the folding leg assembly and the front legs as well so that they all line up in the same plane for vertical board operations. Awesome workbench, just bought the plans. Now all I need is a workbench to build my workbench. Not at the moment or any time soon, I have enough “regular work” and whenever I can make time I prefere to spend it on new projects. Hello, wich drawer runners did you use? In the movie I saw, that you unlock the drawers by pressing on them. That’s neat. Nothing can fall out, when moving the MF-TC. I used normal full extension runners, and installed a latch at the back, but you can also get runners with a built in push to open latch. Tim, I purchased your three sets of plans a few months ago and I believe I requested the imperial plans. I only received the all metric plans. Can you please send me the imperial version? thank you. Hello Dave, as mentioned on the plans and project page, the US plans are adapted to imperial sheet goods thickness but the remaining measures remain in metric. I’m sorry if that wasn’t clear when you bought. Timothy,what is the weight of the product? Tim, where did you get the adjustable 100mm feet from? I got them from a local hardware store which happened to sell those, the brand is Camar and they are made in Italy. you could call yourself now “Sir Timothy” ! Have you seen the new FESTOOL MW1000 ? Clearly a copy of your design by FESTOOL ! Well done ! https://www.festool.de/zubehoer/203802—mw-1000-set – it is in German, but I am sure you understand it. Hi Timothy, a lot of people are interested in what you are doing. Festool as well. I hope yhe link works, and i hope you have received a lot of money from them. The changed a lot, but the idea is yours. I am witing untill festool produces your MFSC. Oeps. Did have an old site open. Did not see the post before me. Sorry to bother you but is the flip up/mft style hinge able to incorporated into your design? It should be if you place the T-track on the bench table at the right height, but I have never been able to check this for sure. Ok thanks for taking the time to answer – I have just bought your plans. HI I’d like to know where I can purchase the “real” T-tracks from. I do not have a workbench yet! Is this one goos to start? Especially, il it stable enought to use hand tools like plane or chisel? The feet look quite slim for this? Just discovered your YouTube channel and website. Nice to see Eben Emael again, just live across the Dutch border. Sorry to bother you, but would the plans work on another system as well? Just invested in makita tools and boxes and was wondering if the makita trolley would do the trick as well. Good luck with the farming and woodworking. Anyone know where to buy readymade MFTC in the US?